And it’s very, very pink. The last kind of chocolate to be invented was white chocolate 80 years ago. Late last year, a chocolatier mentioned that they had another one - ruby chocolate, made out of a specific kind of cacao bean. Most cacao has red colour compounds somewhere in it, this is partly where the very rich brown colour of good chocolate comes from, but late last year Barry Callebault found a way to bring this red (and the fruity flavours that come with it) just a little further out. No colour has been added to this. It’s not white chocolate that’s been somehow dyed. It really, truly is that pink. And it’s about to hit the market. A ruby Kit Kat is being made, among other things. 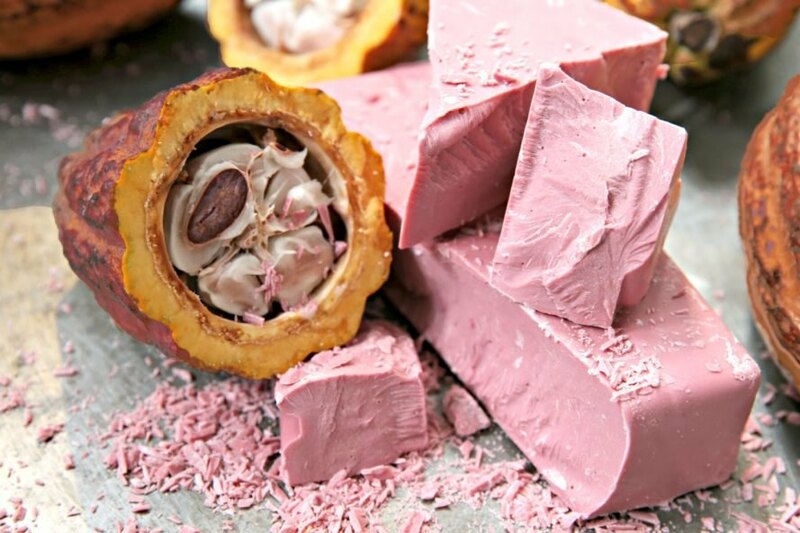 Would anyone here buy pink chocolate? I think this is awesome and I want to try it. Not sure I trust KitKat (Nestle?) to make it taste good though. I'd totally try it just plain! Would they add anything to it, like milk? White chocolate is NOT chocolate thank you! And besides, I like my chocolate the way I like my women! I love chocolate. I'd try it in a heartbeat! But not a KitKat version....I just can't imagine that being accurate to the actual taste of the chocolate. I'm not crazy aboyt chocolate and only like a few kinds, but I definitely want to try this. The color is gorgeous and I'm very curious about the fruity flavors. They’ve been very cagey about the process they’ve used (if I had to guess what they’ve done, I would guess it was something to do with the very early step where they ferment the beans; when cacao beans first come out of the pod, they’re sort of very pale yellowish or pinkish white, and fermenting them makes them a much darker red-brown...if it’s not fermented or only very lightly fermented, that would explain why it doesn’t seem to taste very “chocolatey”, fermentation is a key part of making chocolate taste like chocolate!) so I can’t be certain, but I would assume they’re adding milk. The only kind of chocolate that shouldn’t contain any milk is the very, very dark variety, and even that would sometimes have a little. ...you mean this isn’t why you chose your wife? Damn it Asher. Keep an eye out. Other things may appear. Apparently this doesn’t taste very “chocolatey” at all. It’s apparently sweet, and the few tasting notes I’ve seen specifically mention berries, though they swear no colour or fruit has been added. I’m not sure. I don’t do a lot of work with chocolate, so this is really not my field! Last edited by Matchbox; 05-10-2018 at 01:25 AM. Well now I'm pretty positive that I'm going to like it! Thank you for sharing this, otherwise I'm not sure I would have ever known of it!